Did you ever really explore the difference in taste between coffees? This was the inspiration to found our company: To have the long waited for experience of tasting a great cup of coffee from a small roaster. It is impressive how many exclusive tastes await us that we don´t even know about or perhaps notice. To discover them we need the required know how, a refined palate, the right nose, some luck, or the right roaster. 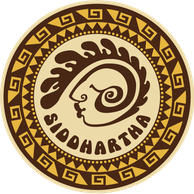 Kaffee Siddhartha GmbH made the task to import high quality and exclusive organic green coffees from only sustainable cultivation to supply small roasters. Therefore we are looking selectively for the best coffee producers. We examine, taste, and evaluate the coffees with experts and roasters to only choose the best coffees with strong convincing qualitative characteristics for the close selection. Our clients appreciate the direct relationship with the coffee farmers, the transparency about cultivation and production circumstances, the immediate relation to the cultivation territories and the farming families, the varieties of the plant, as well as our stories of our firsthand experiences. Our coffee prices are independent from the stock market; therefore a financial pressure on the production during periods of low world market prices is avoided. Our prices include a surcharge for fair trade, which flows directly to the small farming families. This enables them not only to build their homes and cover their living costs, but also improves their quality of life by building schools to educate their children as well as common public places for sport and community activities. It also facilitates finance of ecological production so that the quality of our organic coffees can be ensured since necessary investments, e.g. in facilities for quality control, further education measures, or new machines, are possibly done. Our coffees are cultivated in harmony with nature. Ecosystems and biodiversity are protected actively. Synthetic substances like fertilizers or sprays are not used. The coffee plants grow in synergy with the shadow trees and the cherries are collected by hand only. The harvested beans are washed with natural spring waters. Quality is always priority and its improvement is measurable. We are specialized in Peru, which is one of the biggest coffee producing countries in the world, making coffee the most important agricultural product for Peru´s export. The coffee production enables high employment and for many of the domestic traditional and indigenous farmer families, it is the living foundation since many generations. For us, social equity and ecological responsibility is of highest importance. Therefore our farmer families gain fair prices and only operate ecological agriculture. Peru is the first country which exported organic coffee. It also has the highest ratio in the world of organic coffee produced from the total amount. Moreover Peru is known for its diversity, balance, and exclusivity of coffee. Our choice of coffees includes the highest quality grade only (Grade 1). Classification of the grades can be found under Download. So if you are interested in any of our outstanding green coffees, please feel free to contact us anytime!